Note: This review was for the location at 4699 E. Speedway Blvd. in Tucson. That location closed, so I'm listing the address of the closest location that is still operating. El Charro Café is a chain of four restaurants in the City of Tucson, and I understand a fifth is soon to open. Operating since 1922, there are not many Mexican restaurants in any city that can claim such a long history of serving customers and continuing to make money doing so. Before eating at El Charro my experiences at Sonoran restaurants had been less than satisfactory on repeated occasions. In Tucson, Phoenix, and even Las Vegas, I had found Sonoran restaurants that were bland and missing the vibrant flavors that typify all the other styles of Mexican food. It was not simply a lack of the hot chiles served in New Mexico style food, but flavors that were muted to almost non-existent compared to any of the other styles of Mexican cuisine. Some Sonoran restaurants provided satisfactory meals, but others seemed to be more Amerianized than Mexican. Just as the Mexican food in El Paso has its roots in the neighboring state of Chihuahua, Arizona Mexican cuisine originated in the Sonora area to the south (and from what I understand, also extends to neighboring states such as Nayarit). While El Paso has developed its own interpretation of Chihuahua style food, it is somewhat innacurate to state that Arizona style food is separate from Sonora style. The two seem to be pretty much the same thing. In looking for a good representation of Sonora style food, I think one could do a lot worse than El Charro. I was quite surprised by the flavors, and I believe I was served the "real deal." I say this because of the freshness of the food, the strong flavors, and the fact that there was so much variety. Meals start with chips and salsa. Serving these appetizers has become the custom in the United States, but every restaurant has their own version of salsa and few make their own chips. At El Charro, the chips were good, but the Salsa was the real treat. Red and green salsa are served in a jar that can be poured on the chips. Both salsas were quite spicy, almost to the level of New Mexico chile, but toned down enough so that the flavors were not overwhelmed by the heat. I thought this was an excellent beginning to a meal. Just seeing the description of the house specialty would make me want to try it, but I think the actual experience surpassed my expectation. The meat is prepared in such a way that the flavors offset each other, and no one ingredient dominates the others (except perhaps the lime). The carne seca is served several different ways including a plate with guacamole and beans. I tried the Carne Seca Burro wrapped in a flour tortilla with the meat inside. This was a meal in itself (although probably more like a lunch portion). Although I would possibly describe the meat as the restaurant's "best item," it is not something I would want to order as a whole dinner. 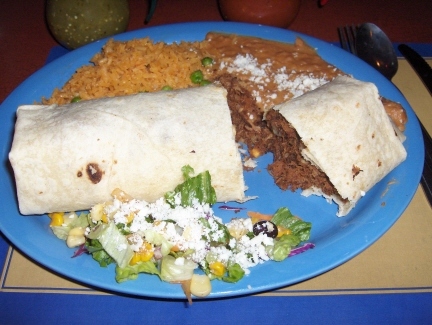 It was really the combination of the other items with the carne seca that made El Charro a good experience. Enchiladas come in quite a few varieties, and the restaurant is willing to make substitutions so that customers can order what they want. 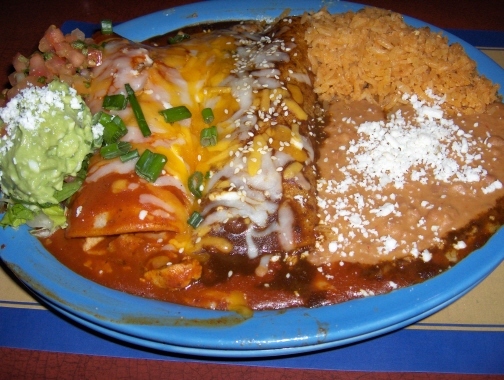 Each enchilada is substantial, and two normally come on a plate. In sharing a meal with a dining companion, I thought an order of two enchiladas and a carne seca burro was just about the right amount of food. The menu lists different types of moles, but the waiter said there was only one. I do not think this was correct, but neverthless I ordered an Enchilada with Mole Chocolate Classico. This was the same type of mole made with chocolate that is popular in Texas and northern Mexico (I think the other types of moles tend to be found more in central and southern Mexico). If El Charro claimed that this was a home made mole I would definitely believe it. Ones that come from a mix tend to separate into liquid and solid portions, while this one had a good consistency throughout. Its freshness was evident, and the flavor was good. I thought the flavor was muted to the point that it almost reminded me of Sonoran food I had eaten in the past that I thought was very uninteresting. Nevertheless, I thought the mole enchilada was good (but like the carne seca, only when eaten in combination with other things). El Charro does not seem to serve cheese enchiladas as are found in Texas and New Mexico, and when I asked the waiter he indicated that the enchiladas already had cheese and that I needed to order some type of filling. The menu listed beef, shrimp, fish, and chicken, so I have to assume that in this case the waiter was correct in stating these were the types that could be ordered. I got a Chicken Enchilada with Red Chile Colorado, one of the types of sauces that can be ordered (along with green and mole). Like the salsas, the red chile was actually surprising for how flavorful it was. It was less spicy than the New Mexico version but I would say in terms of taste was just as good. I had heard people say they thought Arizona Mexican cuisine was just as good as New Mexican food, but just not as spicy. Past experience had not shown this to be the case, but with El Charro's red enchilada I was beginning to be a believer. The only problem was that the chicken was so tough and flavorless that I wished the restaurant did serve cheese enchiladas instead of ones with meat. Guacamole comes with the dinner orders, and this was another case in which the flavor was quite good and the overall quality exceeded my expectation. I think some of the same seasonings used in the carne seca gave the guacamole its unique taste. Beans and Rice were both excellent. The white cheese used on top of the beans was an excellent touch. Dinners come with a side portion of Pico de Gallo which I also liked. This was mild enough to eat with chips, or even by itself if you are used to spicy food. The carne seca was dry, according to my more knowledgeable dining companion, and turned out to be the major flaw in the meal. I still enjoyed it, and thought the quality of the chicken in the enchiladas was a bigger problem. There were so many good points that these flaws seemed minor to me. From reviews I had read on the Internet many people seem to think El Charro has gone down in quality over the past few years. Based on these expectations, I was pleasantly surprised by just about everything that was served.